On January 11th, 2019, the Software Engineering students of Cohort 1 graduated after a full year of hard work and extreme dedication. A year ago, many of these students had little to no coding knowledge whatsoever. Today, they can all officially call themselves Full-Stack Software Engineers. In fact, over half of the graduating class already have job offers — with three students starting their Software Engineering career at DMI on Monday. Graduation Day this past weekend was particularly significant as it was the first cohort to ever join the Kenzie family. Through the dust, the construction and general “new-ness” of the school, these students took a chance on Kenzie and reaped the benefits tenfold. We couldn’t be prouder of every single one of our students today. Right at 2PM on Friday, Cohort 1, along with friends, family and staff, excitedly took their seats and I took to the stage to kick things off. After providing my opening remarks, I shared a video of all the Software Engineering instructors offering up their advice and well wishes. The first speaker was the Head of Software Engineering, David Michael Gregg (or DMG as we’ve all affectionately called him). Next, Kenzie Co-Founder and CEO, Chok Ooi took to the stage to impart his words of wisdom and congratulate the students on their accomplishments. One thing, in particular, that he noted was that each student’s level of confidence had grown significantly from the day they started to the day of graduation. Following Chok’s speech, John Harden, Principal Software Engineer at Kerauno took to the stage. In his promise to “Pay it forward,” John has definitely left his footprint here at Kenzie; speaking with Kenzie students, practicing mock interviews and providing valuable feedback to us for current and future cohorts. John Harden, Principal Software Engineer at Kerauno, sharing his words of wisdom. When John hopped off the stage, Cohort 1 student Nick Howell got on stage to talk about his experiences at Kenzie and how he discovered the program. What’s particularly amazing about Nick’s story is that, after being underemployed for so long, Nick was offered full-time employment with DMI because of his extensive training here at Kenzie Academy. After Nick’s speech, it was time to officially graduate our students. 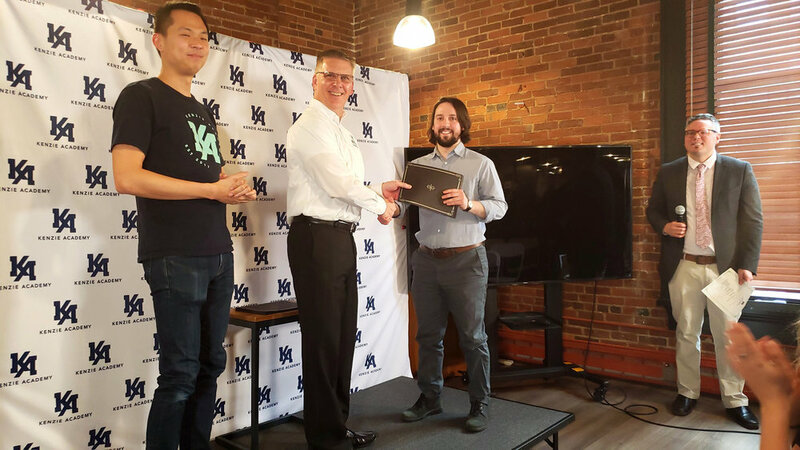 With the help of Butler’s Executive Director of Executive Education, William Gulley, students received a certificate from Kenzie Academy, as well as an official certificate from Butler University. Butler’s Executive Director of Executive Education, William Gulley presenting a dual Kenzie/Butler certificate to Cohort 1 Graduate, Jake Berg. Last, but not least, Kenzie Student Evangelist, Erika Kotterer had a few parting words for Cohort 1 — expressing how proud she was of the class and giving words of encouragement. And it was after Erika’s kind words that Kenzie Academy’s first Cohort was officially DONE. A HUGE congratulations to Cohort 1 for all of their hard work over the last year. We can’t wait to see all the amazing things you accomplish. As always, if there’s ever anything you need, always feel free to reach out. Once a part of the Kenzie family, ALWAYS a part of the Kenzie family. Are you feeling inspired by Cohort 1’s graduation? Y’know, you can be part of the Kenzie family too. If you’re interested in a career in tech, go ahead and APPLY HERE!